When The City Mayors Foundation conceived the World Mayor Project in 2003, it was decided to present a bi-annual prize to mayors who have best shown that they have the vision, passion and skills to make their cities amazing places to live in, to work in and to visit. 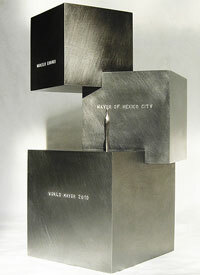 The World Mayor trophy has been sculpted by Berlin-based Kaspar Swankey since 2004. Manuel Ferrari, born in Nice, studied traditional and 3D computer animation at the Surrey Institute of Art and Design in Farnham, England and at Supinfocom in Arles, France. His work includes three animated films using computer animation and models. The films have been shown at a number of international animation festivals in Europe. In 2002 he worked in Thailand. Since 2003, he has been working on a number of 3D film projects and documentaries in London and Amsterdam, where he now lives. 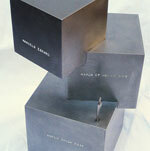 In September 2004, Manuel Ferrari was appointed City Mayors' creative director. He designed the critically acclaimed World Mayor Prize. to design and make functional items of quality and beauty.